We recently caught up with The Veer Union to find out what makes this emerging rock band tick. 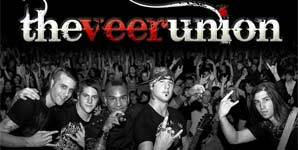 CM: The name "The Veer Union" what does it mean and why did you choose it as your band name? TVU: Before TVU, we were all in different bands, playing music for all the wrong reasons. It wasn't about the music anymore, we all needed a change. The word Veer means to change direction, so we all wanted to veer away from what we were doing and start playing music for all the right reasons. We ended up doing this together, as a Union. The just means the, lol. CM: How would you describe TVU sound? TVU:You'll have to come to a show to find out! CM: You write positive lyrics - Heavy bands sometimes tend to wallow in "doom & gloom" what makes you so positive? TVU:We write everything based from life experiences. A lot of songs on "Against the Grain" are written about hope, trying to find your way out of a dark place. CM: You guys have been touring hard - what can we expect from a TVU show? TVU:Like I said, you're going to have to come and find out for yourselves. I like to think we put on a high energy, passion filled set. Bottom line is, we have a blast from the minute we start to the last ringing note. CM: You have toured with some great bands - now and in the past. What does sharing the stage with these bands teach you? TVU:We have learned a lot from so many bands. Every night we learn something new. I think we can all agree that we've learned how to be a "tighter" band. Sharing the stage with these bands has helped us critique and better our own set. CM: What is a typical TVU fan? Why? TVU:We have a demographic anywhere from the age of 8 to 68. Especially from all the touring, we've learned that age doesn't matter as long as you can relate to the music. We want everyone to be a part of The Veer Union! CM: Does being Canadian not American affect your music? I would say Neil Young's Canadian upbringing can be heard in all his music? TVU:It's hard to say. Canadian radio and American radio are two very different charts. Us being an alternative rock band, we can definitely be played in both markets. Prior to signing with Universal, we were touring independently in the states for about two years. I guess you can say we've been targeting the American market since day one. CM: You worked with two talented producers Greg Archilla & Brian Howes on the album. What did those guys bring to your project? TVU:Both Greg and Brian were great to work with. Very relaxed yet creatively driven environments which helped us really catch the right vibes for the songs. We are all so very proud of the record! CM: Is there any particular musicians or producers you would love to collaborate with in the future? There are so many, I don't even know where to start! CM: You are involved with the "You Can Be Anything Foundation" - tell us about your involvement and what this program means to young kids? TVU:The You Can Be Anything Foundation is a non profit organization that tries to raise awareness and money for music programs in schools. We are so happy to be apart of it because high school is where all of us got our starts. There is nothing cooler than having a student that night message us saying "hey, you guys rocked! You just inspired me to pick up my guitar again!". Now that means something.